Moonglow Burlesque is a unique performance troupe based in Beijing, which brings on stage diverse entertainment in the authentic vintage Burlesque and Cabaret style. 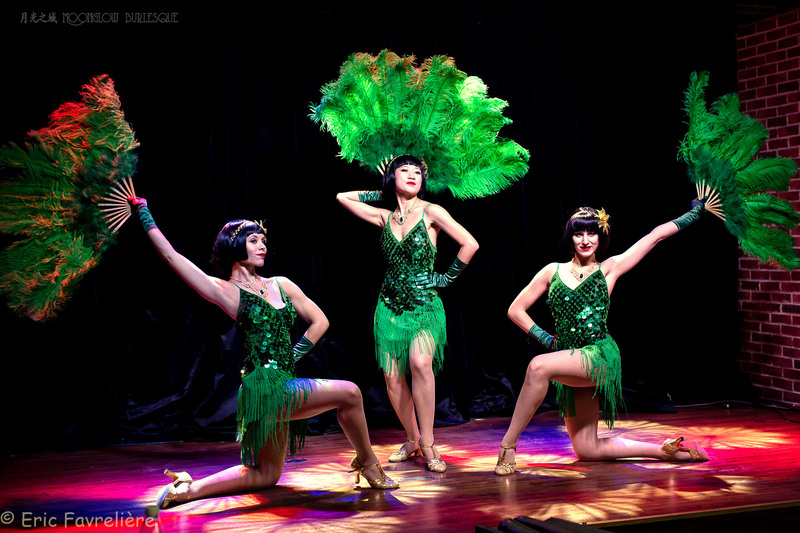 We design original costumes to create that signature glamorous look, and for the past seven years were delivering the top scale vintage entertainment. Formed in 2010, the troupe includes a diverse group of performers (dancers, singers, actors) from China, Russia, United States, South Africa, Cuba and other countries, all with a rich background and professional education in dance and musical performance. In this variety show, the main character Clementine will lead you to the Enchanted Garden, to meet two of the celestial vedettes: the Flower Fairy and the Phoenix! 综艺秀是卡巴莱表演中的缩小版本；每小节将会有一位表演者登台，嘉宾有更多时间享受鸡尾酒和彼此聊天。No cover charge variety shows are a smaller version of what you can see in our cabaret. The performers will do different acts throughout the night, giving the guests more time to enjoy their drinks and conversations. The Enchanted Garden 奇幻花园 New Season Program! Moonglow Entertainment is in constant search of new ideas and concepts to keep the audiences excited and amazed. Twice a year we make a huge effort in designing a whole new creative idea for the new season. This spring Moonglow will present something more elaborate than ever, in the fine-detailed romantic style of Art Nouveau. 1月24日 (周四)，月光之城将盖茨比主题派对带到“仙吧”（东隅酒店一层）. 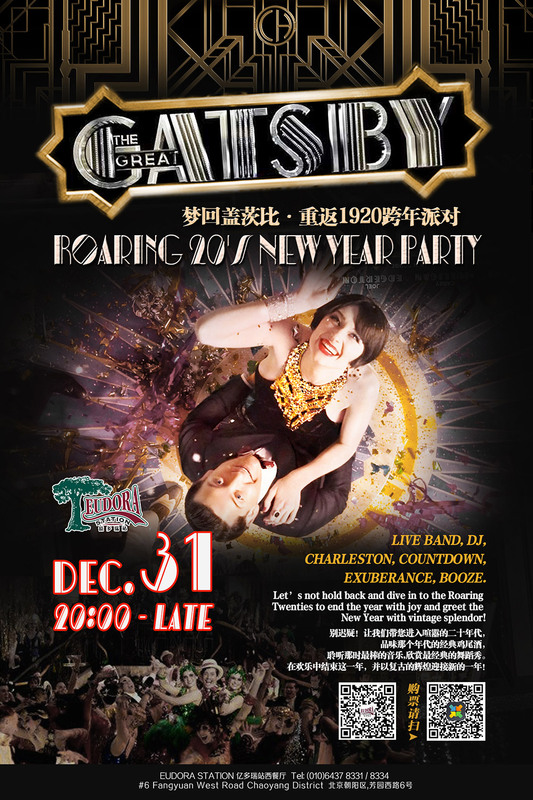 This Thursday, Moonglow Burlesque will create the glamorous Gatsby atmosphere at Xian Bar to celebrate end of the year and let everyone to experience and enjoy the vintage vibe and the glamour of Jazz Age in a casual and interactive way. The showgirls will have a few live performances, will be taking photos with guests, giving out prizes, and teaching how to do the 1920s dance craze – the Charleston! Don’t miss the chance to see the final big show of the Winter Follies, Holiday revue on January 19th! While the holiday vibes are still in full spin with Chinese New Year approaching, we would like to invite you to a family friendly dinner show at Eudora Station. 在观看歌舞表演同时和朋友及家人享受美食美酒。此秀适合任何年龄阶段，虽然成年人可以品尝到具有暗示性的滑稽风格和戏弄性的舞蹈动作，但孩子们可以欣赏到舞台上的欢乐，风趣的表演和复古华丽（而不是太暴露！）的服装，以及假日主题中生动的角色扮演。This show is suitable for any age! While the adults can savor the suggestive burlesque style and the teasing dance moves, the kids can appreciate the colorful (and not too revealing!) costumes, holiday tunes and vivid characters we bring out for this show. Fun for the whole family!! 月光之城女郎新年倒计时！New Year’s countdown with Moonglow! 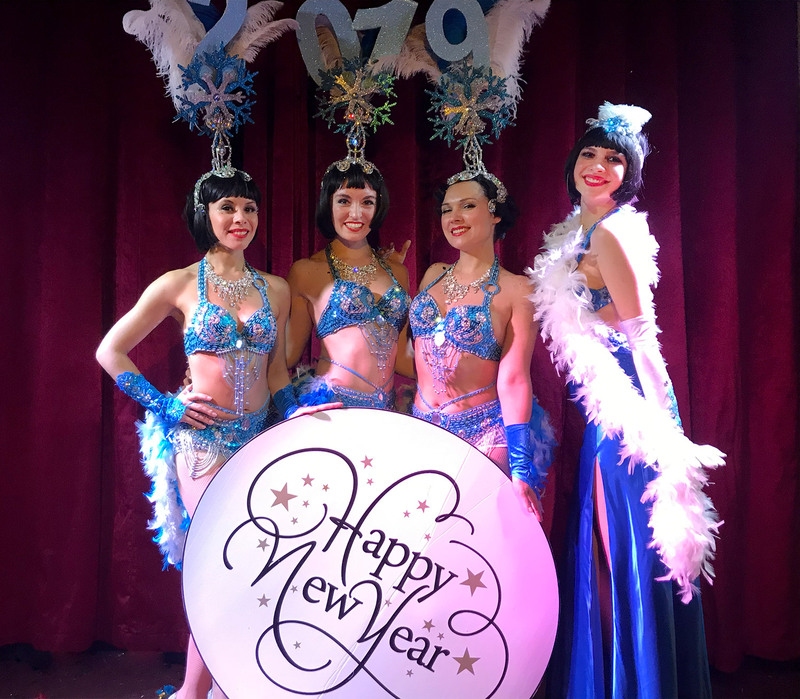 Moonglow showgirls will be performing for the New Year’s Eve celebration at Eudora Station! Let’s ring in 2019 together Gatsby style! We hope you had a wonderful Christmas and a warm cozy week! But now it’s time to let the hair down and kick the heels high to welcome in the new year! Let the holidays continue with Moonglow Burlesque’s Gatsby themed burlesque show at Modernista this Saturday, December 29th! On Christmas eve Moonglow showgirls invite you to Inception bar for a celebration together! There will be the highlight performances from Winter Follies, all in the Christmas spirit and Gatsby style!! FREE ENTRANCE! So come on down after you Christmas dinner, anytime starting from 9 PM for a glamorous vintage night with classy cocktails, champagne and tantalising entertainment!